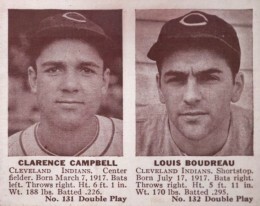 Lou Boudreau's baseball career is divided into several different phases as he was a player, player-manager, manager, and then announcer over nearly 50 years. His playing career was nearly complete by the time the baseball card boom of the 1950s occurred and so the list of the top Lou Boudreau cards covers a wide period, from his rare early cards to his later cardboard appearances, including autographs. Not just the the American League MVP, 1948 proved to be a legendary year for Lou Boudreau as he also managed the Cleveland Indians to the World Series championship. Amazingly, he originally became player-manger of the Indians in 1942 when he was just 25 years old, something that seems unbelievable today. 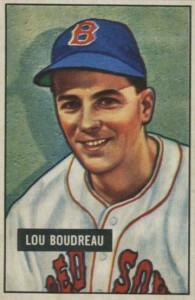 Shop for Lou Boudreau Cards on eBay. 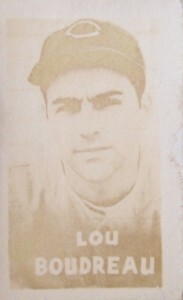 Lou Boudreau had a profound effect on both the game of baseball as well as a one of the most famous records in baseball history. As a player-manager, he introduced the idea of an infield shift when the Indians were facing Ted Williams who often put the ball into the gap on the first base side. As an All-Star shortstop, he also robbed Joe Dimaggio of a hit during the 57th game of Joltin' Joe's hitting streak. On an odd-bouncing DiMaggio grounder, Boudreau had to field the ball bare-handed to thrown him out. It would prove to be Dimaggio's last at-bat of the game and the streak was over. Despite his relevance to the game, Boudreau's appearances on Topps baseball cards are few and far between and he has only one card as a player and two as a manager. You can find Boudreau's next Topps card after an absence of several decades in 1991 Topps Archives The Ultimate 1953 Set. Also featuring earlier designs, there are a few Boudreau cards in 2014 and 2015 Topps Archives that use the 1978 and 1989 Topps design. For fans of painted cards, Boudreau was included in the 1983 Donruss Hall of Fame Heroes set and mini card collectors can finally find options in 2013 and 2014 Topps Gypsy Queen. Although Lou Boudreau baseball card appearances are varied, but few, this top list pieces together a complete and thorough collection, utilizing value as a key component but also measuring the significance of each of his appearances. Typically a team set photo wouldn't be included in an overall top list but Lou Boudreau has so few cards from his player and managerial career that it is important to include his rare Topps appearances. Boudreau had two Topps cards from his tenure as the first manager of the Kansas City A's, who had just moved from Philadelphia and would soon be moving to Oakland. Hall of Fame member Enos Slaughter is also featured on the team photo and Boudreau is seated in the front row, fifth over from the left. 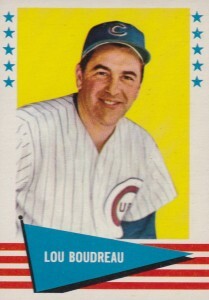 Lou Boudreau took a break from announcing Chicago Cubs games to actually becoming their manager in 1960. His sole card from that brief season can be found in 1961 Fleer Baseball Greats, one of the last Fleer sets before a Topps lawsuit would stop them from producing cards. The company would turn their attention to stickers until the 1981 Fleer set ended the Topps monopoly. 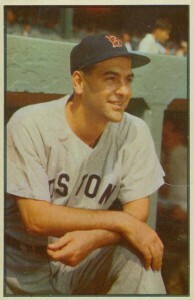 Boudreau transitioned from player-manager to just manager with the Boston Red Sox and his 1953 Bowman Color card features him managing from the steps of the dugout. Boudreau had his one winning season as manager of the Red Sox in 1953, finishing fourth in the league. The "magic" part of the first-ever baseball cards released by Topps was that they came out of the pack looking blank with a printed reverse side. Once the front side was moistened (often with spit) and exposed to the light, it would show the photo of the player featured. This is card #1 in the set and the only single-player Topps card from Boudreau's playing days. There are actually two cards for Boudreau as he shares an in-action card in the same set that shows him scoring. The 1948 Magic card would be featured higher on the list if the overall quality was better and it was not quite so tough to track down. 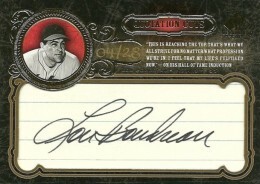 Collectors interested in a Lou Boudreau autograph card will have to look at sets offering cut autographs as he died in 2001 before he could be included in many HOF-themed sets. Several Upper Deck Legendary Cuts series offer cut autographs of Lou in many different designs, so you can pick your personal favorite. The card included on this list is from the 2007 set and features a well-framed and clear Boudreau autograph. The Indians released Boudreau as both a player and manager after the 1950 season and he signed on with the Red Sox as just a player. 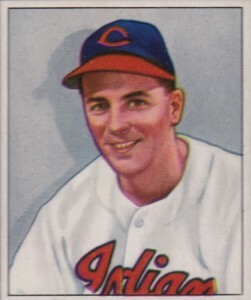 His 1951 Bowman card is nearly identical to his 1950 Bowman appearance except that a Red Sox uniform seems to have been painted over the top of the Indians jersey in the previous year's edition. 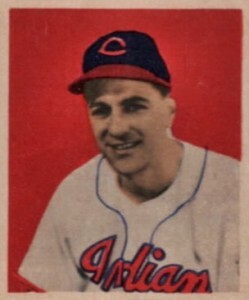 1950 Bowman would feature Lou Boudreau's last appearance with Cleveland on a trading card from his playing days. He also led the Indians as their manager to an impressive 92-62 record, but it was only good enough for a fourth-place finish in the American League. The reverse side of this card reminds us that Boudreau was a basketball star at the University of Illinois before becoming an All-Star shortstop. The only release by a company called Gum Products, the Double Play set from 1941 features two teammates on one card. Boudreau's inclusion would prove to the closest option to a true rookie for collectors. Although the card wasn't designed to be cut into two cards, versions that just have Boudreau's half of the card are worth substantially less. 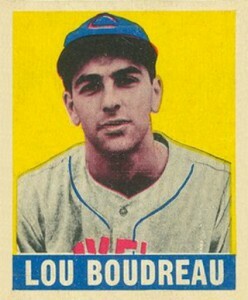 Lou Boudreau's appearance in 1949 Bowman is in the first series of the set and so it does not include his name on the front of the card. 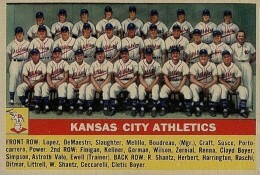 Nameplates were added after card #108 in the series. Another change occurred in Bowman's printing process as the first series cards were printed on white backs that were later changed to gray. This makes the white backs slightly more valuable to collectors. Featuring a simplistic yet very beautiful design, 1949 Leaf was the first color baseball card set made after World War II. It must have also been incredibly frustrating for collectors trying to build a complete set as the set skips several numbers so that in the end the 98-card release is numbered up to 168. 1951 Bowman Lou Boudreau # 62 PSA 7 NM Near Mint Boston Red Sox HOF Beautiful!